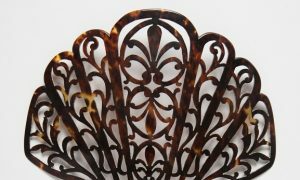 To the Hopewell Culture, ancient Native Americans who sought out the exotic from near and far, metal was a rare and precious resource. Copper, found in its pure form or laboriously extracted from rock, was common, but they didn’t have the technology to smelt iron. So how and where did the Hopewell come by enough near-pure iron to produce a handful of exotic beads, small tools and other decorations? In short: from space. A new study led by geologist Tim McCoy of the Mineral Sciences Department of the Smithsonian’s National Museum of Natural History, traces a set of iron Hopewell beads to their source meteorite. Whether the Hopewell were the first to discover the prehistoric meteorite, or acquired it through interactions with other Native Americans is a subject of debate in anthropological circles. McCoy is lead author of the study published recently in the Journal of Archaeological Science, which adds to discussion on how the Hopewell may have obtained the metal. In 1945 two dozen tube-shaped metal beads were found in Hopewell burial mounds in Havana, Ill. 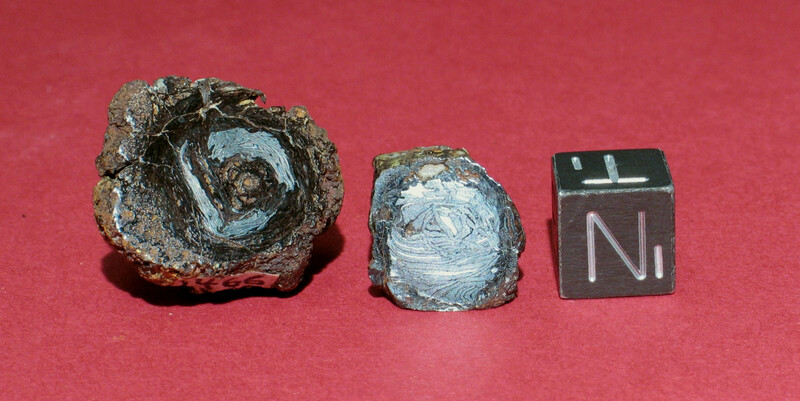 The Smithsonian now holds two of the beads in its National Meteorite Collection. The beads in particular drew McCoy’s interest because of his own Native American heritage: He is a member of the Miami Tribe of Oklahoma, whose ancestral territories covered parts of Indiana, Illinois, Ohio, Wisconsin and Michigan. In the 1970s, the beads were identified as chemically and structurally similar to four raw meteorites in the Smithsonian collection, in part because of a distinctive crosshatch feature known as the Widmanstatten pattern. 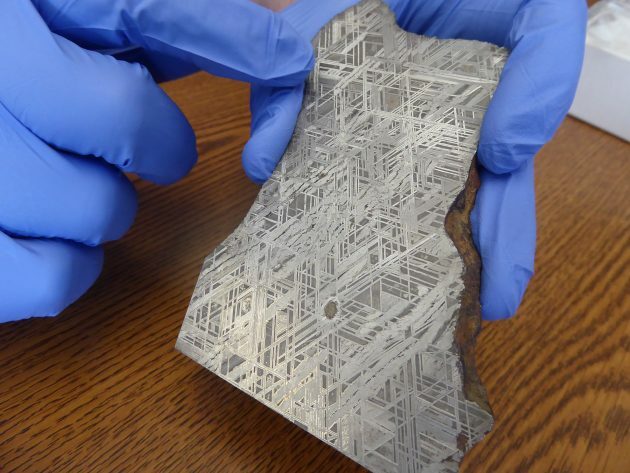 The crosshatching only becomes apparent when a meteorite is cut open and polished. One meteorite from Australia was eliminated due to its distant origin, leaving meteorites from Anoka, Minn.; Edmonton, Ky.; and Carleton, Texas as possible candidates for the beads’ source material. 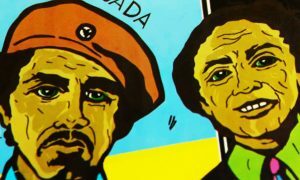 New scientific instruments that were not available to researchers even a decade ago, let alone when the major analysis of the Havana beads was done in the 1970s, allowed McCoy to closely compare both the beads with the Anoka, Minn., fragment. With virtually identical ratios of iron, nickel and phosphorous, very close matches in other trace elements, and fine-grained structural similarities, it’s unlikely the beads came from a source other than the Anoka meteorite. The original Anoka fragment was found in 1961. 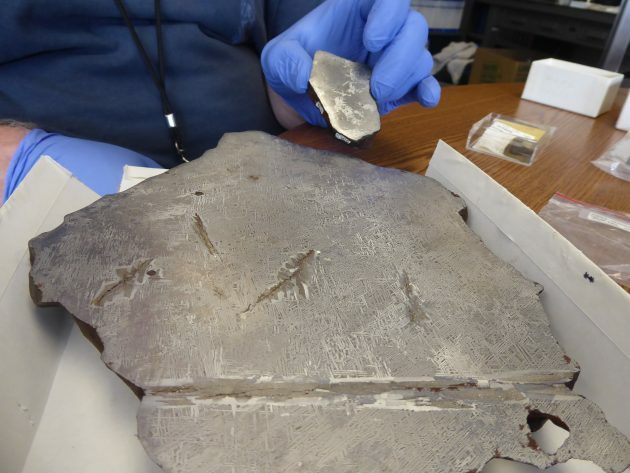 When a second, larger piece turned up just across the Mississippi River in Wisconsin in 1983, it suggested the parent meteorite broke up on its way through the atmosphere, and was strewn across the landscape in a “fall” of fragments. This means more pieces could have been found during the intervening millennia. Analysis of rare gas isotopes, produced by cosmic rays while the meteor was still in space, suggest the original mass of the intact Anoka meteorite was in excess of 8,800 pounds (3,991.6 kilograms). The 1961 fragment weighed only 2.44 pounds (1.11 kilograms); the 1983 piece added another 198 pounds (89.8 kilograms). One of the hallmarks of Hopewell culture is their seeming affinity for the foreign and the exotic. Hopewell sites have turned up fossilized shark teeth from the Gulf Coast, mica from the Appalachian Mountains, and obsidian and grizzly bear teeth from the Yellowstone National Park area in Montana. 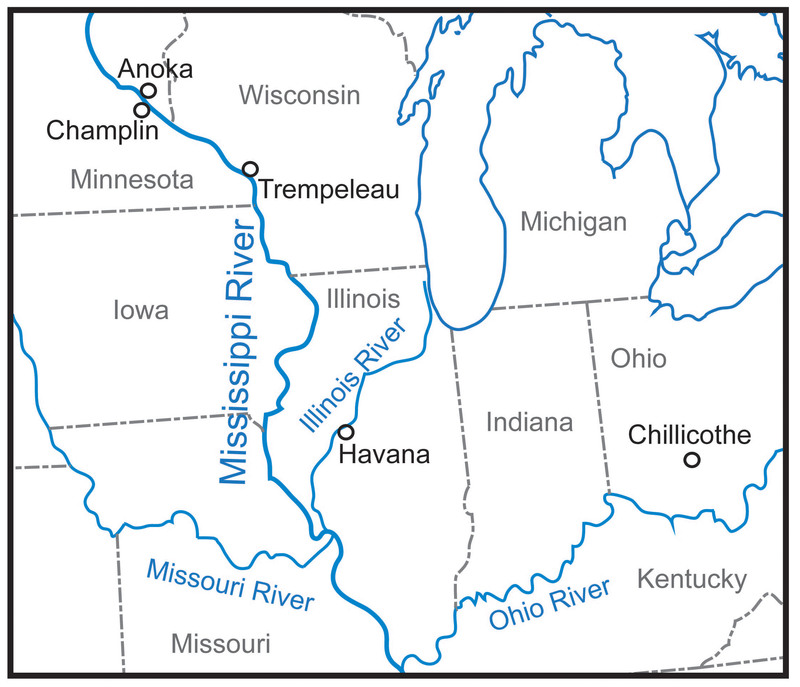 Yet, as far as the archaeological record shows, the Hopewell people never lived in these places. Just as it is unclear how the Hopewell obtained these items from far away, how they acquired iron meteorites to make into beads is also a mystery. They could have sent travelers to collect such objects, or the iron pieces could have come to the Hopewell via a shadowy trade network. It could have also just been a chance find. For the Havana beads, McCoy thinks it has something to do with rivers. Havana is on the Illinois River, a tributary of the Mississippi 500 miles downstream from where the Anoka meteorites were found. What is certain, though, is that none of the Hopewell people ever acquired a very large piece of meteorite. Of the more than 100 Illinois-area Hopewell sites excavated in the last 150 years, only 5 ounces (160 grams) of iron artifacts have been found—about the weight of an average hockey puck. That includes the Havana beads. By contrast, just under 13 pounds (6 kilograms) of copper was found at a single burial site in Illinois in 2015. For the study, McCoy also demonstrated how early American Indians might have fashioned such beads some 2,100 years ago, by making one of his own with little more than a hot campfire, sticks and stones. 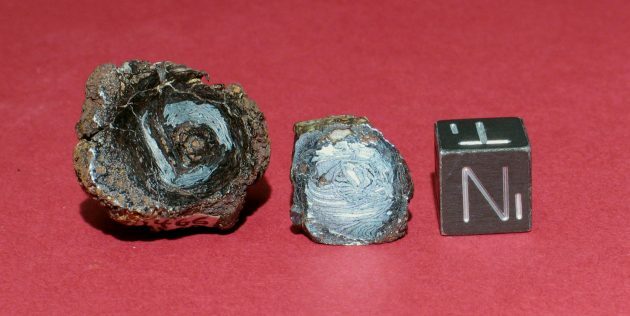 The iron-nickel composition of these meteorites allows them to soften easily in the very hot coals of a wood fire, around 1,200 degrees Fahrenheit. 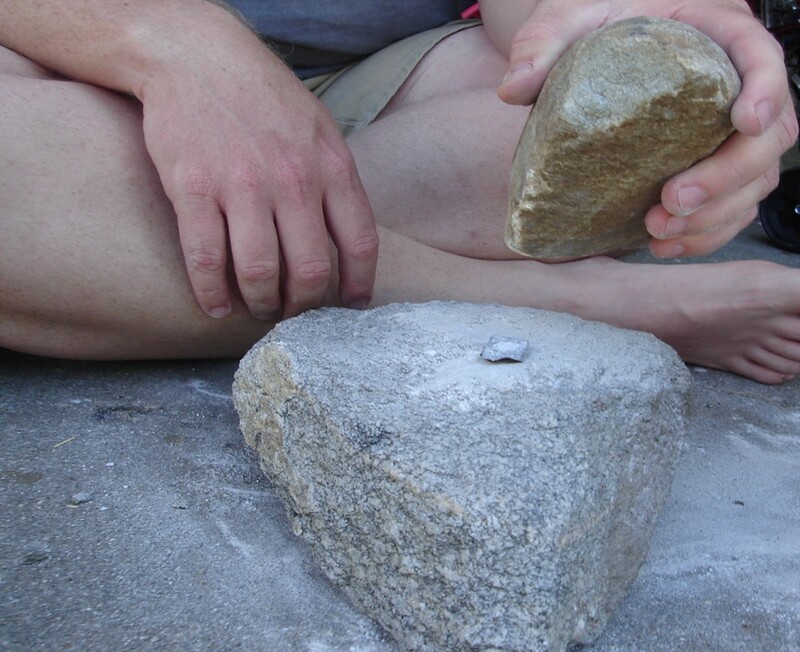 On his brother’s farm in Illinois, McCoy used flat granite rocks to pound and shape a heated chunk of meteoritic metal into a bead that resembles an ancient one from Havana. 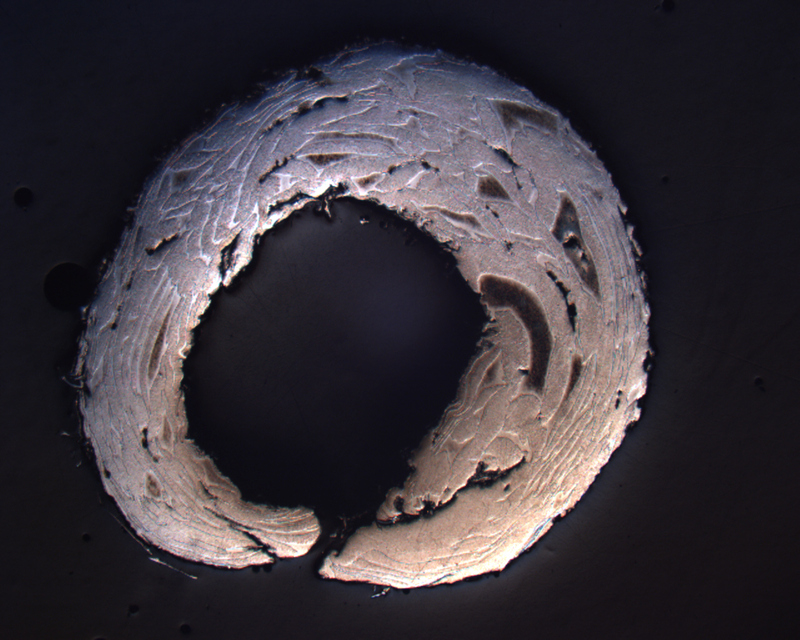 An earlier experiment with modern metalworking tools resulted in a bead with a too-perfect surface, inspiring McCoy’s attempt with more historically accurate methods. 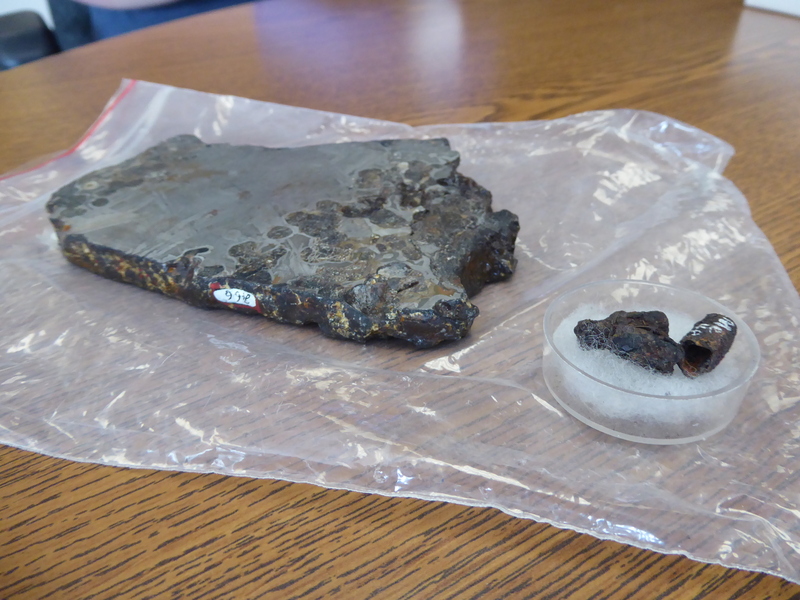 Many of the other Hopewell-era meteorite objects haven’t been examined with modern analytical tools, so this study could prompt further investigations of where their meteorite material came from, McCoy says. Knowing the iron’s origins may help clarify how and where the Hopewell people were sourcing their exotic goods. 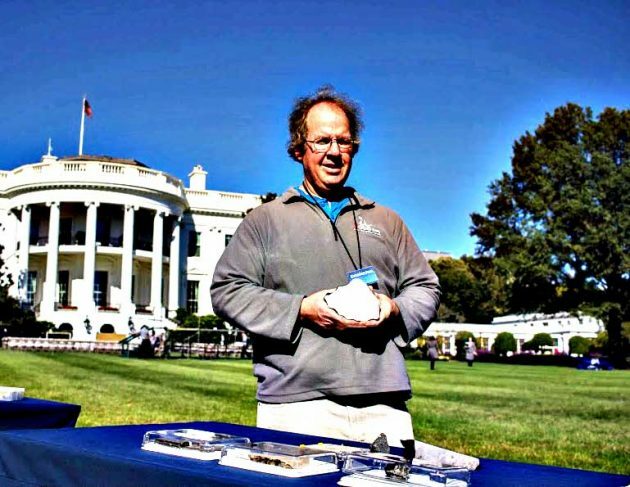 “The new study of Illinois Hopewell iron beads is thought-provoking work that will definitely open new avenues for understanding trade in prehistoric North America,” says Ken Farnsworth, an archaeologist with the Illinois State Archaeological Survey and a Hopewell expert.